In case you missed it, you can click here to watch Obama’s speech at NASA today and read the transcript here. Overall there were not a lot of surprises in this speech. NASA still gets a budget increase. The shuttle is still on-track for cancellation, the Constellation program is also going to be canceled, with transportation to and from the ISS to be provided by private companies. The ISS will be extended so that it can actually be used now that it is built, and to make our international partners happy. NASA will begin designing a heavy launch vehicle for trips beyond low Earth orbit, and returning to the Moon is no longer a high priority. This timeline is aggressive but plausible, and looks pretty darn good, considering that the Augustine commission found that even with a $3 billion per year increase in funding, Constellation wouldn’t get us to the moon until the mid 2020s. This fits in very well with the “flexible path” option described by the Augustine commission, and the Roadmap for Space Exploration proposed by the Planetary Society. I think a lot of people underestimate the value of having a series of goals, building off one another, rather than a distant goal and few milestones along the way. 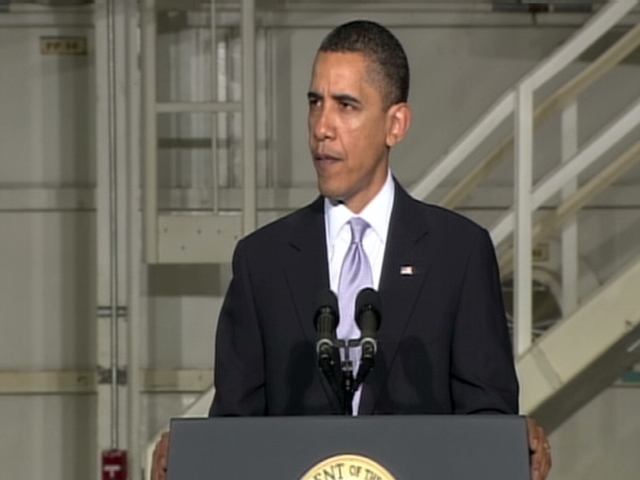 Obama also talked about the new plan to keep the Orion capsule to use as a “lifeboat” from the ISS. I’m somewhat skeptical about this, although obviously NASA will need to continue to develop some sort of capsule to return astronauts to the surface from other missions. I’d like to see more details on what changes will be made to Orion, and how this new “lifeboat” capsule will lead to a capsule to be used by exploration missions. Frankly, this sounds to me like a political decision. I was disappointed that Obama chose to echo the “been there done that” attitude toward the Moon. I think the Moon still could play an important role in exploration. Although they are very different worlds, it makes some sense to send missions to the moon to prepare for missions to Mars, for example. But I also think the choice to change from a single-minded focus on returning to the moon is the right one. The moon is just one of many possible destinations. The important thing is that with a launch vehicle capable of sending astronauts to asteroids and Mars, it would certainly be possible to go to the moon as well. So, as I said, not a terribly surprising speech. It’s nice to see some concrete goals, but I’m skeptical of this Orion lifeboat plan. Based on the responses I read on Twitter, there are some space advocates who like the new plan, and others who think it’s the end of space exploration, that their hopes and dreams are crushed, etc. I don’t understand some of the opposition to the new plan, which would give us more capability, sooner, for less money than the original plan. I also don’t understand those complaining about the end of the shuttle. That decision was made six years ago: the time to be angry about that is long gone. For more detailed opinions on today’s speech, I recommend checking out Phil Plait’s post over at Bad Astronomy, and Joe Shoer’s post over at Quantum Rocketry. This entry was posted on April 15, 2010 at 8:49 pm and is filed under Humans in Space, NASA, Obama, space policy. You can subscribe via RSS 2.0 feed to this post's comments. Both comments and pings are currently closed. I am ambivalent about this plan. It certainly beats Obama’s old plan which, to me anyhow (& I don’t think I’m alone here), looked like a death sentence for human space exploration so this revised plan is a big improvement. However, I hate the thought of the long gap between the shuttle’s retirement & its replacement spacecraft flying. I love the idea of going to Mars and the asteroids but abandoning the Moon – and cancelling the old ‘Ares-Constellation’ program when it is finally starting to take physical shape and look like being nearly ‘go’ for human flight seems like utter madness and a huge waste. The “Constellation” return to Moon program may not have been perfect but it’s so close to being finished that to go back to the drawing board now is just gut-wrenching. I’d like to see it go ahead with a replacement program for it starting up as well. We shoukld think ahead butwe should also finsih what was started & give it a real red hot go – after all ‘Apollo’ and the HST had troubled beginnings too. More funding is good but I still think more is needed. I really hope Obama’s plan comes to fruition and actually goes ahead as planned rather than ending up as just more hot air and empty promises. I’d give it about 6 or 7 out of ten – that higher number being dependent on us seeing some significant progress being made soon. The current plan is almost identical to the old plan that everyone thought, for some reason, was a death sentence. It just adds more specific language about destinations and keeps a version of the Orion capsule. You say it’s hard to see Constellation canceled when it is so close to being finished, but the problem is that Constellation is not close to being finished at all. The Augustine report made it clear that even with a $3 Billion increase per year, it would not be finished on time. And we don’t have that extra money, especially if the shuttle and station are extended. I generally agree with you. But I’ve got to take you to task for one of your paragraphs. > I think the Moon still could play an important role in exploration. No, the Moon could play an important role in SPACE DEVELOPMENT (e.g. harvesting lunar water ice for fuel)! And, yes, lunar ice harvesting totally opens up GEO and exploration beyond LEO. Well, OK maybe you’re right about exploration. But for very different reasons. > The moon is just one of many possible destinations. But for space development, it is the only one which is nearby which offers material resources. Proximity really matters because it allows for teleoperations and a quick return for manned missions. > The important thing is that with a launch vehicle capable of sending astronauts to asteroids and Mars, it would certainly be possible to go to the moon as well. We land on the Moon. We don’t dock with it. Different craft are needed. We can dock with an asteroid using an Orion and habitat. But we need a real lander/ascender for the Moon. But my main point is that if we can just get Obama & Company to realize how cost-effective commercial space is and get them to incentivize commercial space to develop lunar resources then it doesn’t have to be a battle between destinations. We can not only have our cake and eat it too but a veritable smorgasboard of other capabilities (e.g. LEO depots, space tugs, huge GEO sats, SPSs, lunar base/hotels). Just make a way of getting lunar reaction mass to LEO first. Then let’s see what can be done. Hi Ryan, Let me preempt your reply. I just read on an older post that you are a skeptic when it comes to lunar water. Don’t know if that has changed with more recent discoveries (e.g. water at the lunar north pole). However, there is undeniably, plenty of oxygen which is 89% of the mass of a hydrogen-oxygen rocket. So, what about it? Is extraction and transport of lunar material a game changer? The amount of water on the moon is, as far as I know extremely small. Most of the detections are of stray OH molecules formed by the solar wind hitting the surface. And the places where there may be more concentrated water (the poles) a) still don’t have very much, and b) are among the coldest places in the solar system, making any operations there likely to be more difficult than they’re worth. Lunar oxygen is a different story. I actually worked on a project a few years back using concentrated sunlight to extract oxygen, and there are many other methods to do the same.